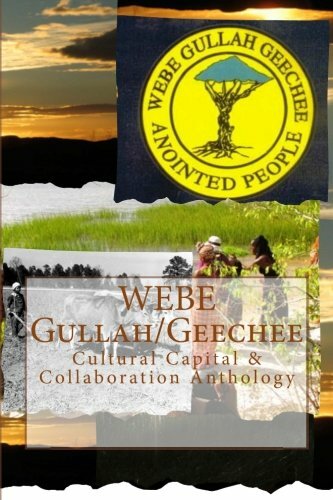 Queen Quet, Chieftess of the Gullah/Geechee Nation (www.QueenQuet.com) has released her long awaiting second anthology, WEBE Gullah/Geechee Cultural Capital & Collaboration Anthology. This is a historic work that details interdisciplinary research within the Gullah/Geechee Nation. Ethnography, anthropology, science, history, and literary reflections and analysis all come to life from these pages as they not only provide the history of the formation of Gullah/Geechee culture, but focus on the issues of leveraging cultural capital in the current human rights movement of the Gullah/Geechee Nation. This anthology tells the living story of the Gullah/Geechee. Disya da who WEBE! True Uhuru Books in North Charleston, SC will host a special “Gullah/Geechee Read In” and book signing with Queen Quet on Saturday, February 7, 2015 at 3 pm. She will also hold a “Gullah/Geechee Read In” and lecture at the St. Helena Branch Library on Wednesday, February 25, 2015 at 6 pm. Both events are FREE! Queen Quet, Chieftess of the Gullah/Geechee Nation (www.QueenQuet.com) is a native of St. Helena and Polowana Islands, SC where her family’s Gullah/Geechee roots stem from. She is a computer scientist, mathematician, environmentalist, preservationist, historian, and author that has been nationally honored as a living legend. This is the second anthology that she has compiled on the history and cultural heritage of the Gullah/Geechee Nation. Those that have read the award winning anthology,”The Legacy of Ibo Landing: Gullah Roots of African American Culture” that Queen Quet compiled have long awaited this book which is a companion to it. Queen Quet has written a series of Gullah/Geechee history books entitled “Gullah/Geechee: Africa’s Seeds in the Winds of the Diaspora.” This anthology takes the readers from the pages of those books to a call for collaboration and into a process of how to respectfully engage with the communities in the Gullah/Geechee Nation. Disya ain drylongson, disya de one bout Gullah/Geechee wha hunnuh wan kno!